One of the Catholic Church’s biggest challenges is encouraging more sacramental celebrations. Although Mass attendance rates have been stable for more than a decade, many Catholics are not at Mass on any given weekend. The percentage of Catholics indicating that they go to confession with any regularity is very low. Many Catholics are still choosing to marry—yet some decide not to celebrate the Sacrament of Marriage in the Church. At CARA we often get inquiries for any data or research on how sacramental participation could be improved. There are many correlations and sub-group differences in our research that are quite telling. One of the most powerful is also a bit surprising. I was reminded of this when reading a recent article by psychologists showing that belief in Hell is negatively correlated with crime rates cross-nationally. Guess what else Hell is related to? How often someone celebrates sacraments. CARA's national surveys of adult Catholics have asked respondents to indicate their belief in either Heaven or Hell and they can answer: I have never doubted this; I have had doubts about this in the past, but I have none now; I have a few doubts about this from time to time; I frequently doubt this; or I do not believe this. (…there are a small number of respondents who say they believe in Hell but not Heaven but they are too few in number to analyze). Strong belief in Heaven and Hell among U.S adult Catholics varies by generation with the youngest Catholics being the least likely to say they have never doubted either. More than nine in ten Catholics of each generation say they currently believe in Heaven although some say they have a few doubts from time to time. 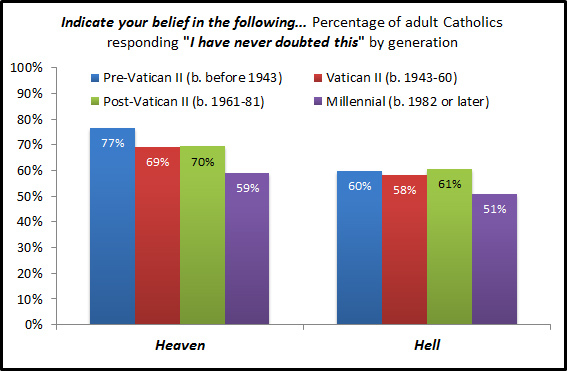 Thus, overall, Millennials are just about as likely as Pre-Vatican II Generation Catholics to believe in Heaven accounting for occasional doubts (93% compared to 98%). 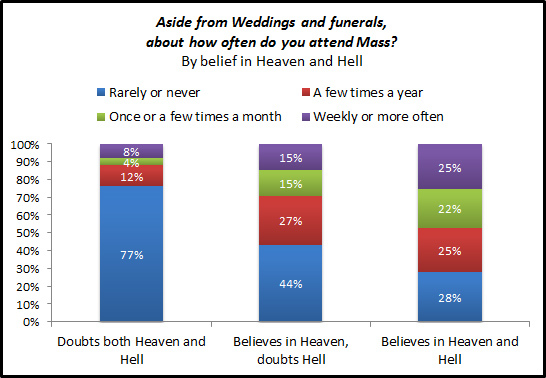 Catholics who believe in both Heaven and Hell have higher Mass attendance rates than those who believe only in Heaven or who believe in neither. Forty-seven percent of Catholics believing in both attend Mass at least once a month compared to 30% of those believing only in Heaven, and just 12% of those who doubt or don’t believe in either Heaven or Hell. That is the devil in the details. This of course has been a hot topic among Evangelicals and it appears to be an issue among Catholics as well. I teach a class at Georgetown called “Catholicism at the Movies: A Critical Review of Portrayals of Faith on Film” where I discuss our popular conceptions of God and the theory of how these may have crept into our religious beliefs altering our notions of judgment and damnation. Think about the portrayal of God in the 1956 film The Ten Commandments (the highest grossing religion film of all time, adjusted for inflation). Here God is embodied in a deep voice (described as “off-screen and to the right” by critic Paul Schrader). This is a depiction of God that showed anger and judgment. In more recent pop culture, God is depicted as non-judgmental and kindly in portrayals by George Burns or Morgan Freeman. This may have played at least a bit part in the imagination of young Catholics where I think some simply don’t think the God they believe in would send them to Hell for missing Mass from time to time. For others, they don't believe it is possible for God to send them to Hell because it does not even exist as an option. If belief in Hell is related to Mass attendance than one would think there would also be a connection to how frequently one seeks out the Sacrament of Reconciliation. 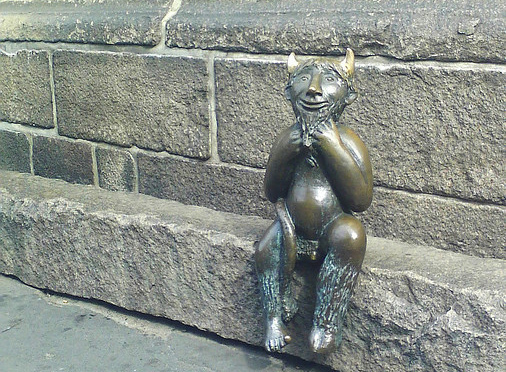 Twenty-eight percent of Catholics believing in both Heaven and Hell go to confession at least once a year compared to 10% of those only believing in Heaven, and 12% of those who do not believe in Heaven or Hell (...note that those saying they “never” go to confession are not saying that they literally have never gone to confession. Most report they celebrated the Sacrament of Reconciliation before their First Communion). For some, urgency and frequency of going to confession may be tied to their own short-term perceptions of their probability of death. It is the case that, generally, older Catholics are more likely to go to confession than younger. This may be part of the reason why still a majority of those who believe in Hell do not go to confession at least annually. Believing in Hell and recognizing one’s own mortality is a transformative event (...even if it is only Pascal’s Wager for some). 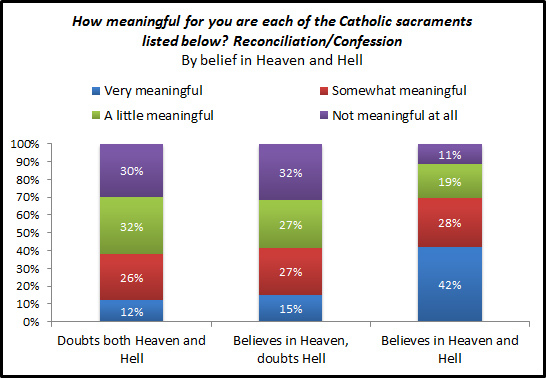 As the figure below shows, 42% of Catholics believing in both Heaven and Hell say the Sacrament of Reconciliation is “very meaningful” to them compared to only 15% of those believing only in Heaven and just 12% of those believing in neither Heaven nor Hell. 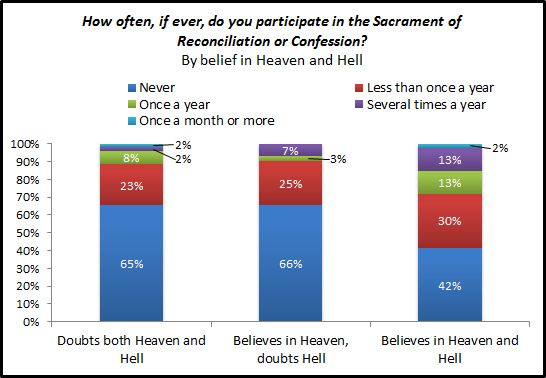 Seven in ten Catholics who believe in Hell say going to confession is at least “somewhat meaningful” to them. Nearly half of all adult Catholics (48%) believing in Heaven and Hell say it is “very important” to them that they receive the Anointing of the Sick at some point in their lives (80% at least “somewhat’ important”). Receiving this is less important among those who doubt or do not believe in the existence of Hell and those who believe in neither Heaven nor Hell. In my opinion, an erosion in belief in Hell among Catholics and perhaps a growing sense that God is kinder and gentler than the booming voice “off-screen and to the right” has had at least some effect on the frequency with which Catholics go to Mass or confession. It feels a bit uncomfortable saying that more “fire and brimstone” may make Catholics more active in sacramental life but the data are no deception. Above photo courtesy of Snurb at Flickr Creative Commons. In a recent post, we noted that there are about 22.5 million people in the U.S. who were baptized and raised Catholic who no longer self-identify as Catholic (i.e., some join other faiths and others report having no religious affiliation and become "Nones"). This number is often quoted and very easy to come by using surveys that include a question about whether one is still a member of the faith that they were raised in. For any religion, the percentage of adults who remain affiliated is called the "retention rate." See the figure below to comparatively evaluate how well the U.S. Catholic Church does in retaining its members (more on this here: 1, 2, 3). All things considered a 68% retention rate is better than many faiths achieve (...all Protestant denominations with sufficient numbers of respondents for an estimation have lower retention rates than the Catholic Church). And if you think it is challenging to be a Catholic parent try being an Atheist parent! Some 70% of Americans raised to believe God does not exist end up being a member of a religion as an adult (about one in five former Atheists drift off to become an open-minded agnostic or None). What is less often noted in the discussion of retention, and only very rarely reported on in the secular press (...with this exception by Cathy Lynn Grossman who inspired this post), is the number of people raised Catholic who left the faith but who later returned to the Church. These people are measured as "retained" in snapshot surveys because researchers so rarely ask about any of the time in between when the poll is being conducted and the respondent's recall of their childhood religion. 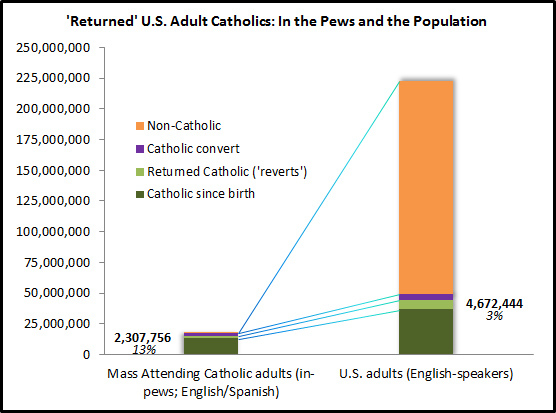 Those who leave and come back are often called the "returned" Catholics or the "reverts." CARA has two data sources that can be used to estimate the size of this population. The first is the responses of 20,031 in-pew surveys from adult Mass attenders in parishes across the country and the second is a national survey of 1,504 adults conducted last week. From these two sources we can estimate that in the pews, on a typically weekend, you can expect that about 13% of the adults in attendance are reverts, which is equivalent to 2.3 million people. These individuals are a part of a larger 4.7 million adults in the United States who self-identify as a returned or revert Catholic. However, this is a bit of an under-count as the survey on which this later number is based was only conducted in English. Using other CARA data sources and the in-pew responses (...where surveys were conducted in both English and Spanish) together we can estimate that there are likely an additional 360,000 Spanish-speaking reverts. Thus, in total CARA estimates there more than 5 million Catholic reverts nationally in 2012 (i.e., equivalent to 9% of all adult Catholics). In a previous post, we noted that the Catholic population could not maintain its approximate 25% U.S. population share by immigration alone as many argue (...given the Catholic retention rate and that only 2.6% of U.S. adults saying they converted to Catholicism as an adult). The math just does not work (...other important factors to complete this equation are the annual number of baptisms, Catholics leaving the U.S., and deaths of Catholics). Part of what is keeping the Catholic population percentage so steady is Catholic reverts. In a typical year, CARA estimates that there are approximately 168,000 people who were raised Catholic and left the faith (typically in their teens or early 20s) who come back. Who are the Catholic reverts? Currently, these are people who are disproportionately between the ages of 25 and 34 (currently a combination of the oldest Millennials and the youngest of the Post-Vatican II Generation). A plurality of regular Mass attending Catholic reverts (41%) are of the Post-Vatican II Generation (ages 31 to 51). Another numerous group of reverts are in their retirement years (age 65 or older). Younger reverts may be coming back as they marry and raise children—seeking out sacraments. Seniors may turn back to the faith of their youth just at the moment they begin to face the autumn of their life. Among reverts who are regularly attending Mass (as measured in CARA in-pew surveys), 47% report that they had attended Catholic elementary school, 30% went to a Catholic high school, 89% celebrated the Sacrament of Confirmation, and 12% went to a Catholic college or university. Those more interested in the life-cycle phenomenon of why and how Catholics revert should check out In the Course of a Lifetime: Tracing Religious Belief, Practice, and Change by Michele Dillon and Paul Wink. If you are not a numbers person and instead want to hear the stories of people who reverted back to the Catholic Church check out these profiles over at whyimcatholic.com. 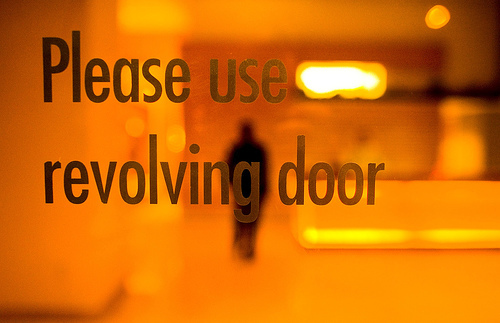 Finally, over at the USCCB here are some tips for how parishes can welcome back reverts. Update/Note: Some of the retention rates in the figure above were never provided in Pew's original report. These are calculated from the original data sets released by Pew for this study (one for the continental U.S. and another for Alaska and Hawaii). In these data there are 432 weighted respondents who say they were raised as Atheists. A total of 131 of these individuals self-identify as an Atheist at the time of the survey resulting in an estimated retention rate of 30%. However, there were a total of 1,387 Atheists (weighted) identified in the survey (equivalent to 1.6% of the adult population). What these findings reflect is that in the U.S. Atheists are for the most part "made" as adults after being raised in another faith. It appears to be much more challenging to raise one's child as an Atheist and have them maintain this identity in their life. 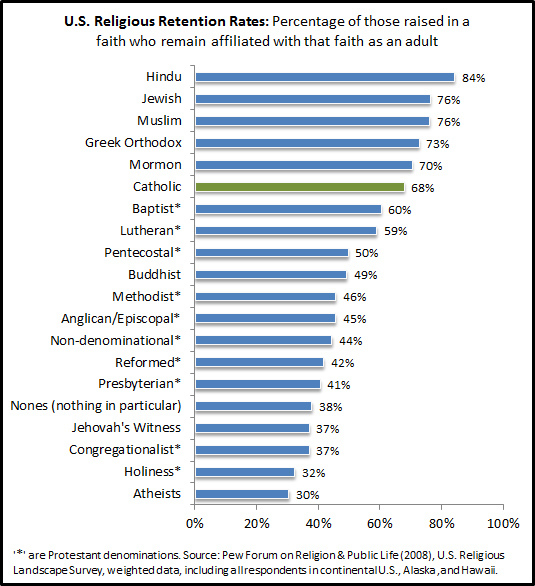 Of those raised as Atheists, 30% are now affiliated with a Protestant denomination, 10% are Catholic, 2% are Jewish, and 1% are Mormon. Some also seem to want to treat (as Pew does in its original report) switching between Protestant denominations as a non-switch. It is true that all of these respondents are still practicing Christianity (as are those who leave Catholicism for a Protestant denomination or for the Greek Orthodox Church) but in terms of the effect on the religious organization and the individual a real change in membership has occurred. I don't think the Presbyterians are just fine with losing 59% of those raised in the faith as long as these former members are in another Protestant denomination's church. From an organizational perspective I assume all of these religious institutions would prefer to maintain their youthful members in a similar regard (...with the exception of Atheists who have no real institution or organizational structure... which may have something to do with the very low retention rate for this group). Above photo courtesy of Thomas Hawk at Flickr Creative Commons. As a survey researcher often working on national polls of self-identified Catholics, I frequently hear the remark, "But what about the Catholics in the pews?" Finally, I can say we've got a poll specifically for that as well. CARA and the Emerging Models of Pastoral Leadership have been conducting a major study for the last two years that aims to get the clearest portrait possible of what is going on in American parishes. The final piece of this project is a series of surveys—still in progress—of parishioners, in-pew during Mass, in a random sample of U.S. parishes (...CARA has also conducted similar surveys in many self-selected parishes and dioceses that have come to us for assistance). Currently, the Emerging Models data includes nearly 11,500 responses from Catholics who took a survey at Mass (...CARA's sample from parishes and dioceses commissioning surveys includes more than 370,000 respondents). Tomorrow, CARA researcher Melissa Cidade will give anyone interested a sneak peak (go here to sign up for the webinar) at what Catholics in the pews have been saying in the Emerging Models project parishes. One of the most surprising aspects of the results so far has been how positive Mass attending Catholics are in their evaluations of their parish (...yet there are also many interesting sub-group differences here as well). I always remind people that many respondents in these surveys have chosen to be a part of the parish they are evaluating. 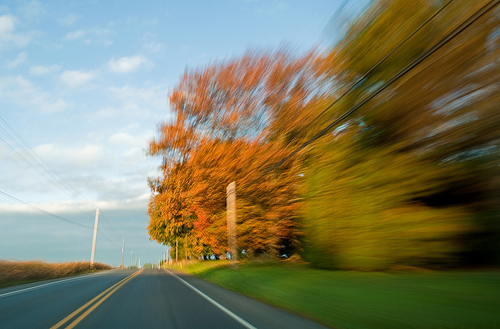 One way we know this is that 31% of parishioners report that they are not attending the parish closest to their home—they may even drive right by another parish on their way to Mass. Some Catholics are clearly going "shopping" and finding parishes where they feel they fit in well or where they feel their needs are best met. Of course with a few exceptions parishes are territorial (Can. 518; Can. 100-107) but there are clearly unofficial "market forces" at work as well and these tendencies may be gaining strength. The figure below shows the breakdown for the question "Do you currently live closer to another parish?" by generation. Recall, all respondents are taking this survey during Mass at the parish they attend (we also ask them if this parish is their primary place of worship. In CARA's commissioned surveys we also ask for ZIP codes). A "yes" response to this question provides an estimate for how many "drive by" Catholics there are. Nearly four in ten Mass attending adults of the Millennial Generation (born 1982 or later) is not attending their local parish (to be fair, in some cases, the closest parish may not be their territorial parish given the structure of boundaries). A third of Post-Vatican II Mass attenders (born 1961 to 1981) responds similarly. 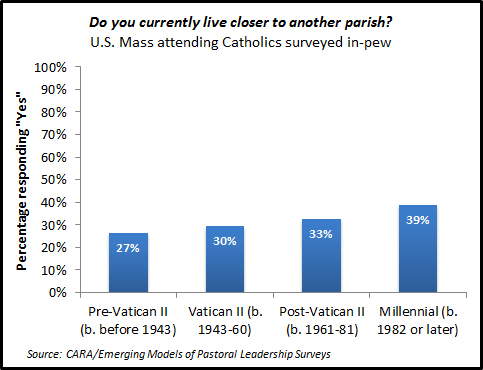 Even more than one in four Pre-Vatican II Mass attending Catholics (born before 1943) is potentially passing by a parish to attend another. In an era where more parishes are closing than opening, these market forces may be putting pressure on some parish leaders. The phenomenon may also be eroding some of the neighborhood culture of Catholic parish communities (in CARA's commissioned in-pew surveys we have discovered parishes that are drawing Mass attenders from other dioceses—most often in the Northeast). At the same time the survey data seem to indicate that this mobility may also make for happy parishioners. For more information about Emerging Models see the report for the first phase of CARA's research released last year entitled, "The Changing Face of U.S. Catholic Parishes" (a single informant survey conducted with 846 randomly selected parishes, margin of sampling error of ±3.3 percentage points, describing the parish and its staff.). We are about to release a report entitled "Perspectives From Parish Leaders: U.S. Parish Life and Ministry" (here is the recorded webinar... stay tuned for the full-report) which is based on a survey of 532 parish leaders (staff, finance and pastoral councils, and other leaders) in 246 parishes from the first phase (margin of sampling error of ±4.2 percentage points). Above photo courtesy of Christopher Lane Photography at Flickr Creative Commons.